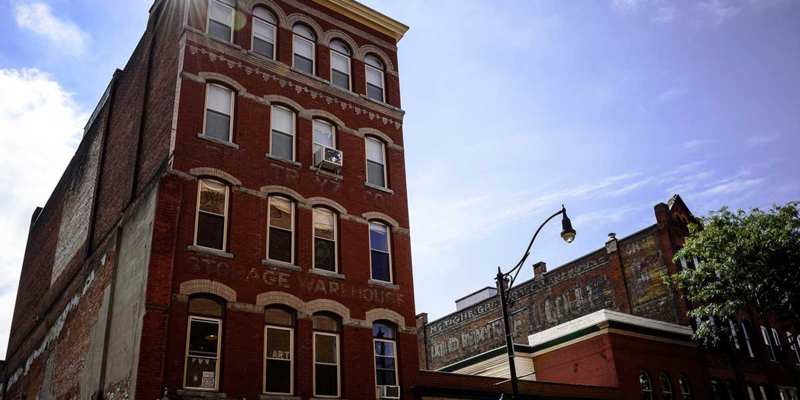 It allowed them to see potential in the 1800s structure that is now home to Anthony Brunelli Fine Arts, where John Brunelli is gallery director. Back then, State Street was pretty much a broken down, desolate section of town. Some 15 years later, Artists Row is filled with other galleries, restaurants, cafes and boutiques. “It wasn’t about knowing there was potential for a scene. It was about creating a scene,” Brunelli says. “These rebels in the art world, they don’t look for potential, they create it. And so the Brunellis took a derelict building on a bad block in a blue-collar town and went to work in 2003. Already a renowned photo realist and painter, Anthony started by bringing his credibility to the operation. Things escalated quickly. A 2004 exhibit of work by a gifted 4-year-old became an instant phenomenon covered by the likes of the New York Times. It inspired a critically acclaimed documentary My Kid Could Paint That distributed by Sony Pictures. Art has a way of revitalizing areas like this slice of Binghamton. It starts with budget-conscious artists who look for large, cheap spaces – like old factories and warehouses – to create in. That builds galleries, galleries draw people, people attract businesses to accommodate them. He’s seen it happen in other cities and he is proud to be a part of what’s going on here. And artists from some of the largest markets want to be a part of the Greater Binghamton experience as well. First Friday Art Walks have become a social staple downtown, drawing thousands for after-hours strolls. Galleries and businesses stay open a little later, vendors set up shop and music performances provide a soundtrack to what by all accounts is a heck of a night out. Tens of thousands in the case of the annual LUMA Festival. Not only is the projection art display a huge draw each September, it speaks to the community roots of Binghamton. In 2008, Brunelli discovered a mid-1970s catalog of local art collections called Binghamton Collects. He decided to track down all the collectors and pieces that were still around. He ended up with some 60 works that he put on display in an exhibit. “I found some of the most incredible pieces of art history that exist on the walls of Binghamton,” he says. Now when Brunelli drives the streets of his hometown, he drives by places where he knows what lies behind the windows: Picassos, Beardens, Piranesis. “This town has a very interesting and unique lineage and part of my role as a gallery owner is to help share that story through the arts,” he says.